Catholic bishops will object to any contraception rules that make it easier for women to get contraception. 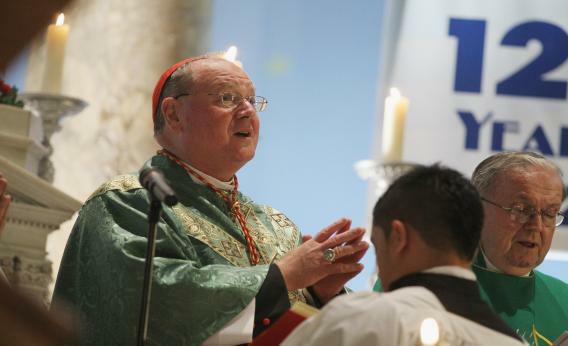 Cardinal Timothy Dolan, Archbishop of New York and president of the United States Conference of Catholic Bishops, is not a fan of the pill. After a short period of feigned investigation into the new contraception benefit regulations offered by the Obama administration, the United States Conference of Catholic Bishops has determined that they don’t accept Obama’s “birth control compromise” and will continue to demand a right to deny contraception benefits, even contraception benefits that they are not actually paying for. Last week, the administration clarified how it intends to let religiously affiliated organizations avoid paying directly for the benefits—the insurance companies will have to reach out directly to employees, without going through the employer—but since the clarification continues to allow women to use benefits they’ve earned, the bishops are not having it. Under the latest proposal, churches and nonprofit religious groups that object to providing birth control coverage on religious grounds would not have to pay for it. Women who work for such organizations could get free contraceptive coverage through separate individual health insurance policies. The institution objecting to the coverage would not pay for the contraceptives. Costs would be paid by an insurance company, with the possibility that it could recoup the costs through lower health care expenses resulting in part from fewer births. The administration refused to grant an exemption or accommodation to secular businesses owned by people who said they objected to contraceptive coverage on religious grounds. The bishops rallied to the defense of such employers. Meanwhile, conservative attempts to use this controversy to extend employer control over the private lives of employees continue. The president of Ave Maria University*, H. James Towey, took it to the next level by going on Fox News to compare earned insurance benefits to food stamps, calling them “contraception stamps.” It’s a nifty rhetorical trick that reframes employee pay as the same thing as government assistance—and just as the government reserves the right to tell you want you can spend your food stamps on, Towey clearly believes that he should control what his employees spend their earned benefits on. Luckily, it seems Obama does not agree. Despite enduring a year of anti-choice employers throwing fits, his administration hasn’t given employers the right to cut benefits because they don’t like how employees use them. Hopefully the administration won’t keep trying to tweak the rules to get a better reaction. As long as women are able to get easy access to affordable contraception, the bishops will oppose it. It’s time to stop trying to work with their unreasonable desire to interfere with women’s private lives and just draft the regulations without their input. Correction, February 8, 2013: This post originally misspelled the name of Ave Maria University.